Suzanne Cruise, an accomplished artist and former staff illustrator at Hallmark Cards, Inc., founded Cruise Creative in 1990. As a respected veteran and featured trade show speaker in the design industry, she has led her company to become one of the top licensing agencies in the country. 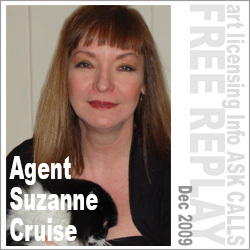 In this interview, Suzanne addresses those questions most asked in regard to artist – agent relationships (including how do you know if you are ready for an agent, and how much art does an agent need), the need for computer skills to compete in the industry (and what those skills should be), and agent exclusivity.